used when the lengths of two sides and the value of the angle opposite one, or two angles and the length of one side are given. used when the lengths of two sides and the included angle, or the lengths of three sides, are given. used when two sides and the included angle are given. 1. Find the number of degrees in the largest angle of a triangle whose sides are 3, 5, and 7. Since cos C < 0 and C is an angle of a triangle, 90° < C < 180°. 2. Find the number of degrees in the other two angles of ABC if , b = 150, and C = 30°. Therefore, B = 45° or 135°; A = 105° or 15° since there are 180° in the sum of the three angles of a triangle. 3. Find the area of ABC if a = 180 inches, b = 150 inches, and C = 30°. If the lengths of two sides of a triangle and the angle opposite one of those sides are given, it is possible that two triangles, one triangle, or no triangle can be constructed with the data. This is called the ambiguous case. If the lengths of sides a and b and the value of A are given, the length of side b determines the number of triangles that can be constructed. Case 1: If A > 90° and a b, no triangle can be formed because side a would not reach the base line. 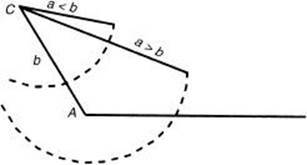 If a > b, one obtuse triangle can be drawn. Let the length of the altitude from C to the base line be h. From the basic definition of sine, sin and thus, h = b sin A. 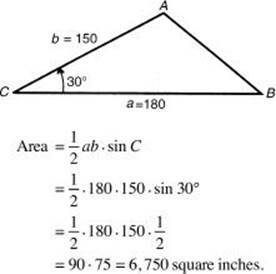 Case 2: If A < 90° and side a < b sin A, no triangle can be formed. 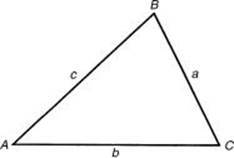 If a = b sin A, one triangle can be formed. If a > b, there also will be only one triangle. 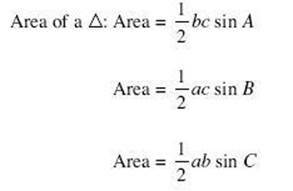 If, on the other hand, b sin A < a < b, two triangles can be formed. If a compass is opened the length of side a and a circle is drawn with center at C, the circle will cut the baseline at two points, B1 and B2. Thus, AB1C satisfies the conditions of the problem, as does AB2C. 1. How many triangles can be formed if a = 24, b = 31, and A = 30°? Because A < 90°, b · sin A = 31 · sin 30° = 31 · = 15 · Since b · sin A < a < b, there are two triangles. 2. How many triangles can be formed if a = 24, b = 32, and A = 150°? Since A > 90° and a < b, no triangle can be formed. 2. In ABC, A = 30°, a = 6, and c = 8. Which of the following must be true? 5. Find the length of the longer diagonal of a parallelogram if the sides are 6 inches and 8 inches and the smaller angle is 60°. 6. What are all values of side a in the figure below such that two triangles can be constructed? 10. Given the following data, which can form two triangles?